I have been telling you that I switched out my colors for Christmas this year and I am enjoying it! 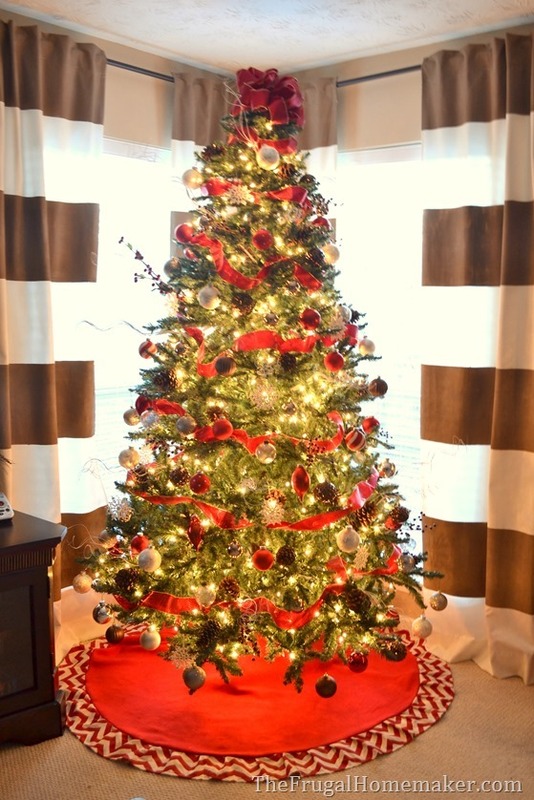 So let me introduce you to my red, brown, and metallic Christmas tree! 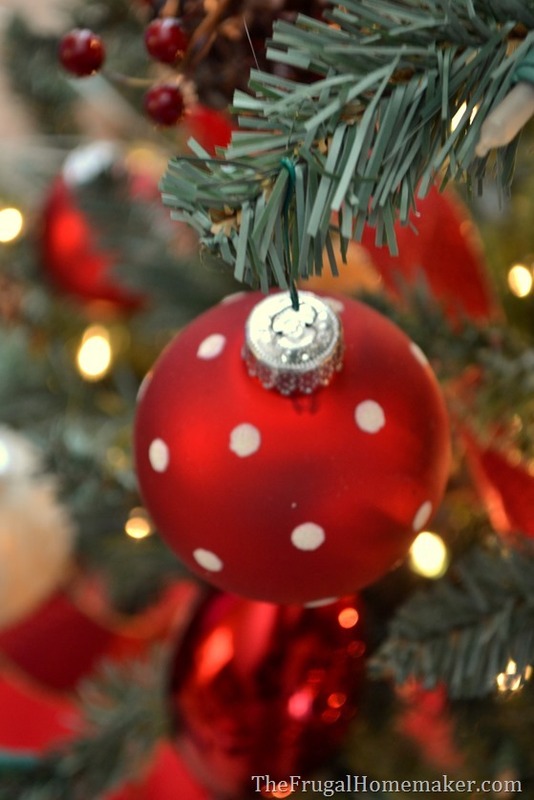 I picked up a bin of deep red, metallic and brown plastic ornaments last year after Christmas at Wal-Mart and that is when I decided that I would incorporate lots of RED into my Christmas décor for the coming year. 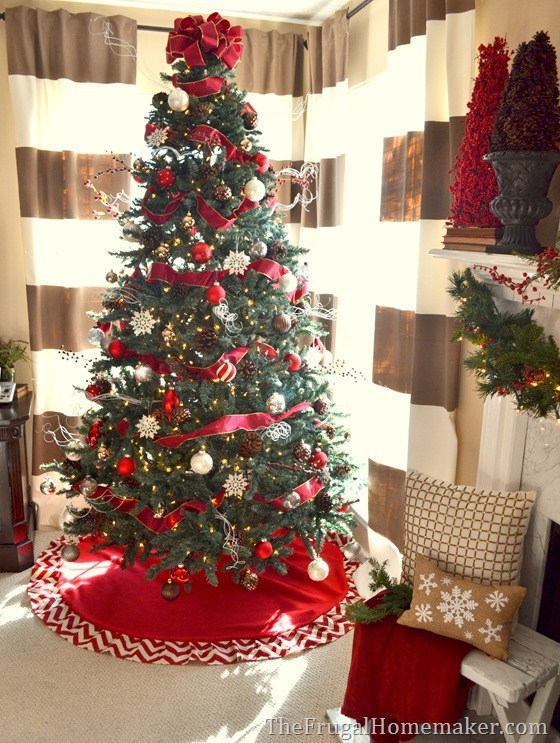 I had always done a burgundy and gold theme in many past years – this was my Christmas décor in 2011. Last year, I totally changed things up and incorporated LOTS of burlap with burlap ribbon on the tree along with golds, mercury glass, white, and browns. 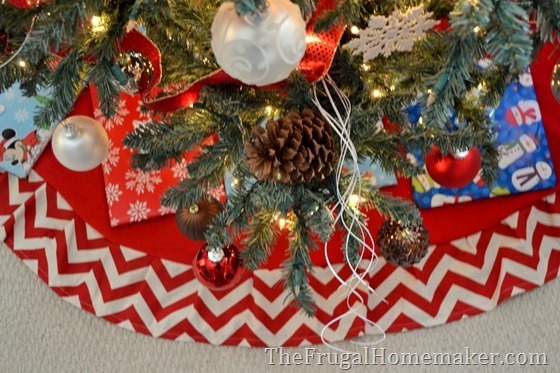 I created a DIY ruffled lace and burlap tree skirt – tutorial for that here. I loved that themed and decor but my husband and I both missed the red. So red it was this year! 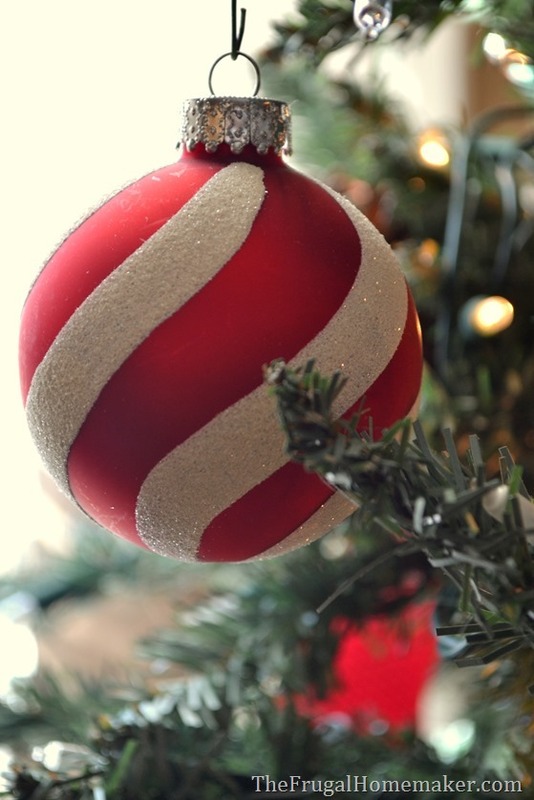 I didn’t buy any new décor this year – just pulled from things I found at yard sales/thrift stores over the last year, a few boxes of red and white balls I had bought on clearance a few years ago, and red décor from previous years. 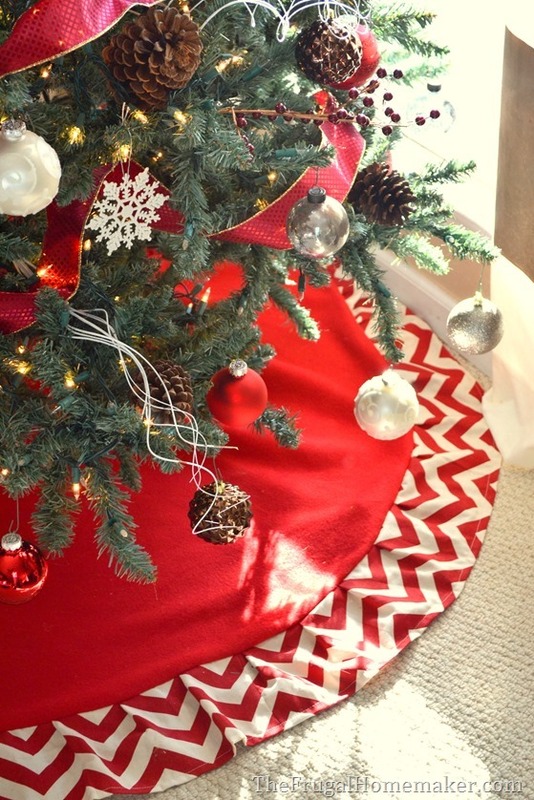 I did make a new red and white chevron tree skirt but that is the only new thing I bought/added to my décor stash. I always love to tuck pinecones all throughout the tree along with stems of berries that I bought on clearance several years ago at Michael’s. The little white snowflakes were a clearance buy at Target a few years back too. Here is a more lit/early evening shot. 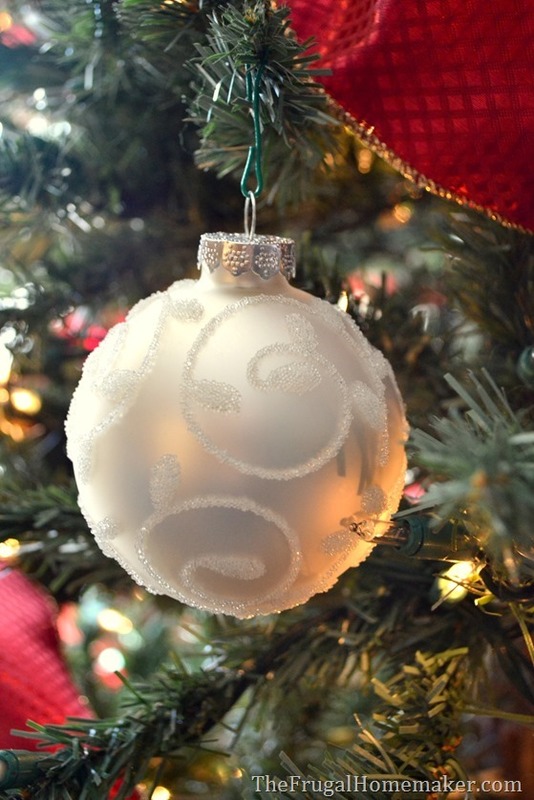 I LOVE having a sparkly, twinkling Christmas tree in my living room – especially in the evenings! Sneak peek of my mantel which I should reveal tomorrow! 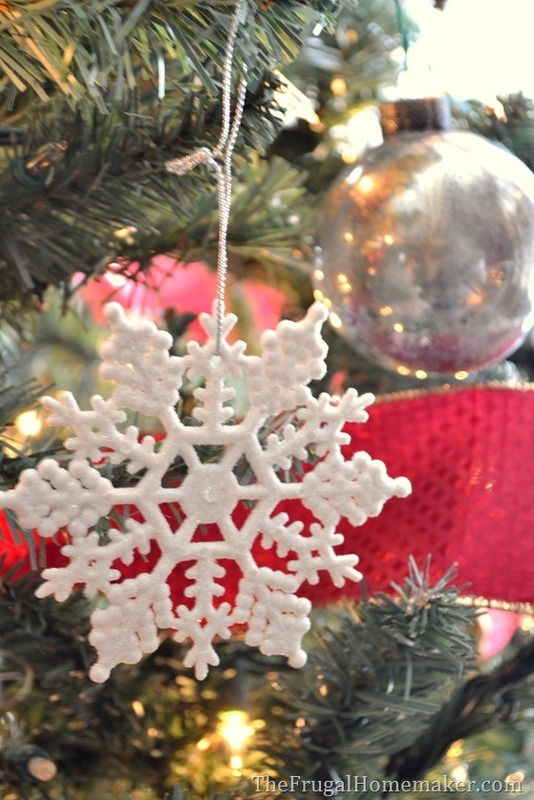 Here’s a couple close-up shots of the ornaments… some pretty embellished white ones. 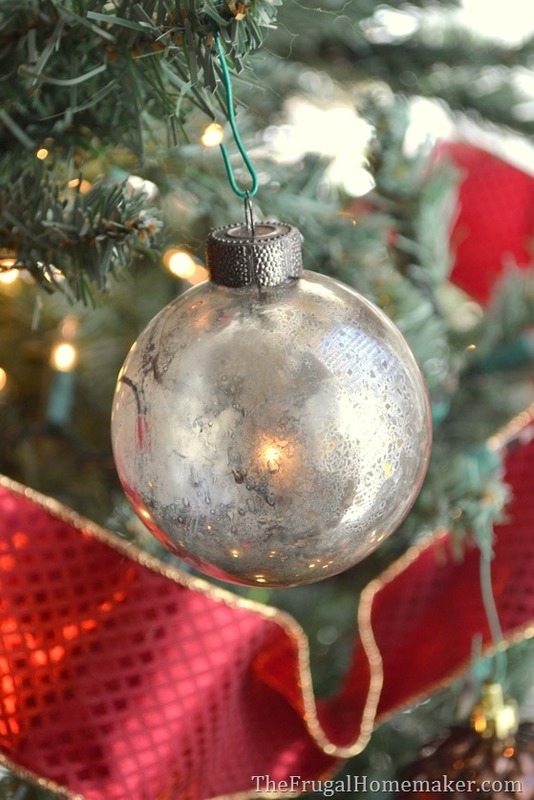 My DIY mercury glass ones from last year – tutorial here. Fun shot of the Christmas tree skirt, tree + ornaments, and few presents wrapped and waiting. These were some new ornaments I had bought on clearance several years ago intending one year to do a red and green tree – so fun! Some more fun red striped ones! Brown ones from my tree last year that I incorporated this year. I LOVE using natural elements and natural colors on a tree. Do you decide on your colors/theme for the next year so you can buy things on after-Christmas clearance? Do you change your colors/theme out every year or always do the same thing? 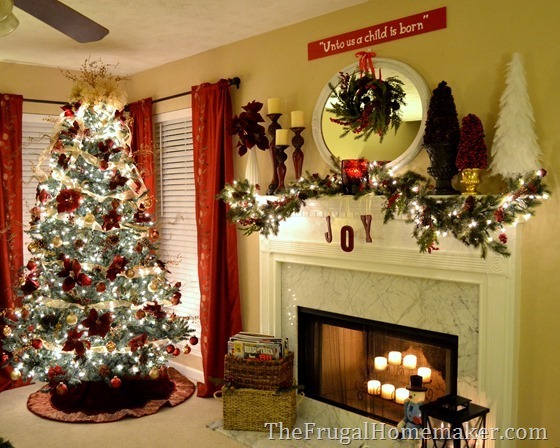 Very pretty tree and I love the trees on the mantle. 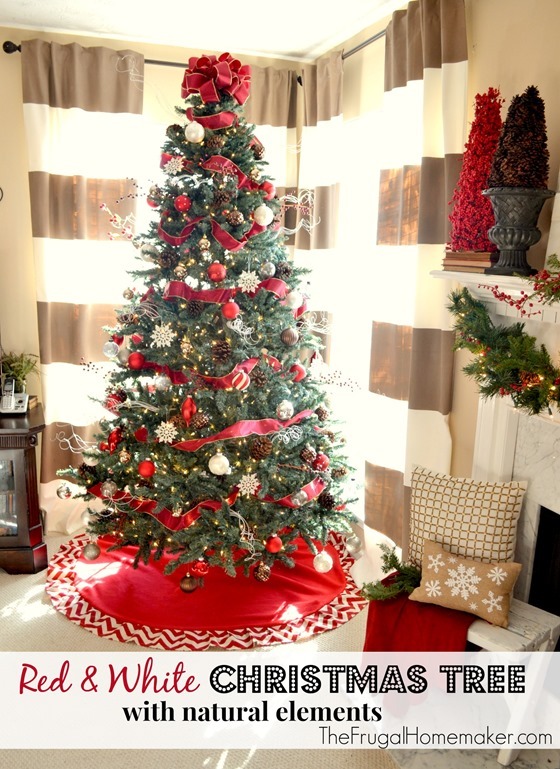 Absolutely LOVE your Christmas Tree!!!!! 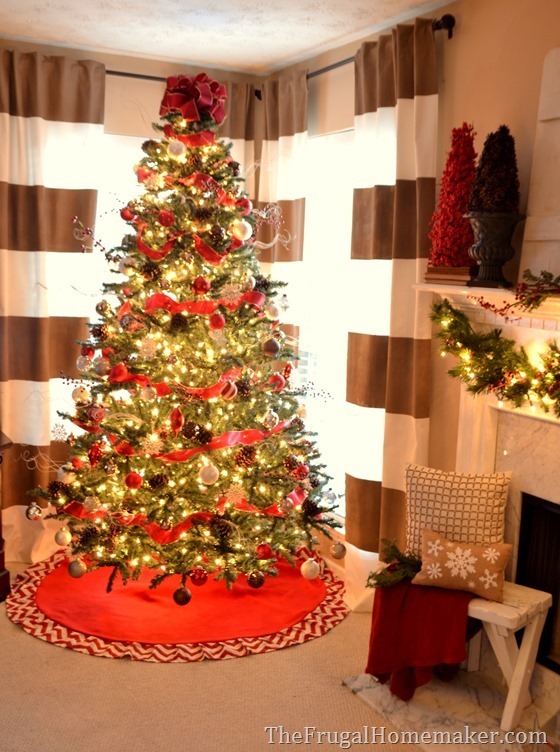 Would you mind telling me where you got your stripped curtains behind your Christmas tree? I have been wanting curtains just like yours for my livingroom. Thanks! 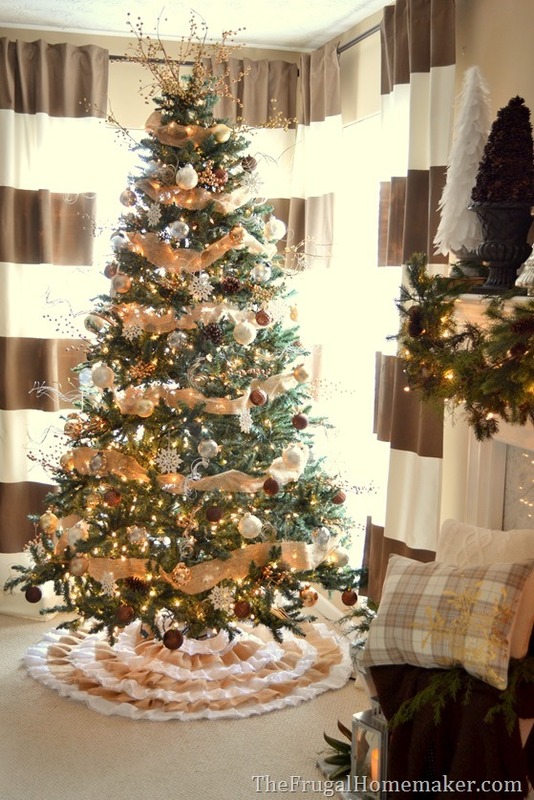 Love, Love, Love your Christmas tree for this year!!! 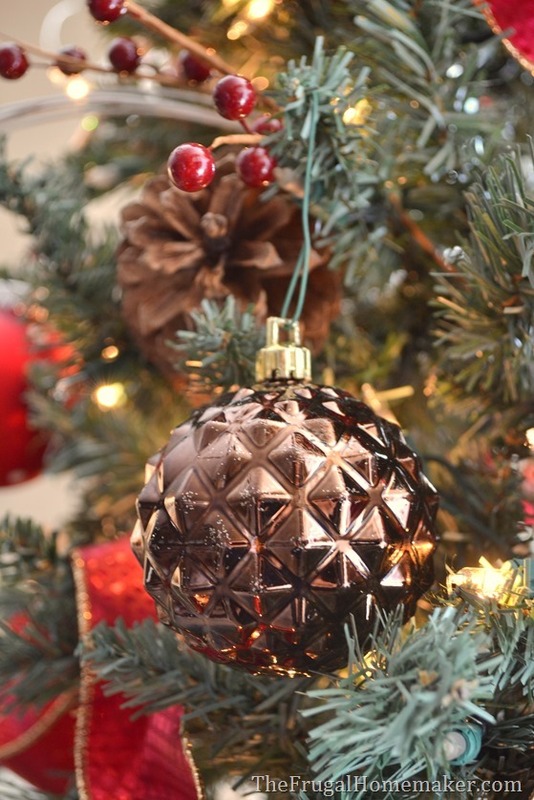 I especially love the pine cones, berries and other natural elements, as well as the earth tone ornaments!! I don’t usually do a theme tree – we have ornaments that our boys have either made or collected over the years, as well as ornaments from our travels and duty stations – so our tree is made up of those. 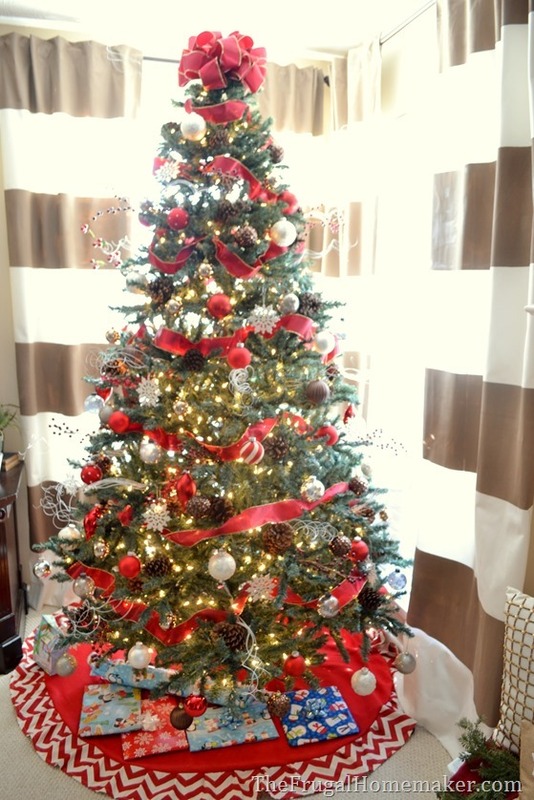 I would love to do a theme tree at some point……thanks for the inspiration! I absolutely all of your trees!! Where did you get the red ribbon?